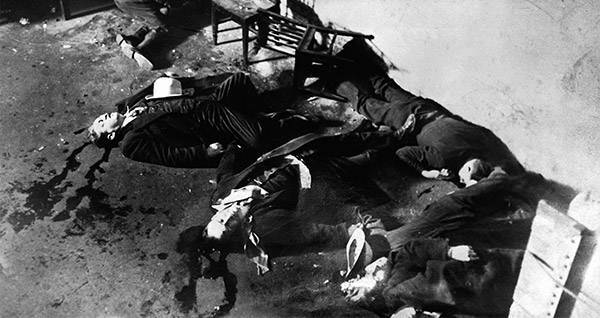 Though Capone was the prime suspect, to this day no one has taken credit for the St. Valentine's Day Massacre. FPG/Getty Images Five of the St. Valentine’s Day Massacre victims. On Feb. 14, 1929, Frank Gusenberg was rushed to the hospital. As soon as he had been stabilized, police arrived to question him as to how he had sustained the 14 gunshot wounds that brought him in, and whom it was that had shot him. “No one shot me,” he replied. Three hours later Gusenberg was dead. Upon his death, Gusenberg became the final victim of a highly orchestrated crime, Chicago’s most infamous mob hit, which would come to be known as the St. Valentine’s Day Massacre. The massacre had been carefully planned and executed by notorious mobster Al Capone, to eliminate a rival gang boss, George “Bugs” Moran. Bugs was a bootlegger and rival of Capone’s, who distributed his illegal liquor from a warehouse on Chicago’s North Side. Though no one was ever convicted of the crime, the consensus is that Capone orchestrated it to simply get Bugs out of his way. Moran had been working on procuring a shipment of stolen Canadian whiskey, an enterprise which Capone was already heavily invested in. Those who believe Capone orchestrated the murders point out that the two mob bosses had had plenty of run-in’s in the past, over territory disputes, and Bugs’ determination to take over Capone’s suppliers. The theory is that Capone lured Bugs to the warehouse, under the guise of readying a car to drive to Canada, and hit him before he knew what happened. Bettmann/Getty ImagesThe warehouse where the massacre took place. No matter the case, there’s no doubt that the hit carried Capone’s distinct style. Around 10:30 a.m. on Feb. 14, four men raided Bugs’ Lincoln Park warehouse. Two were dressed as police officers and armed with submachine guns, the other in suits, ties, overcoats, and hats. Inside the warehouse were five of Bugs’ men, along with two car mechanics. The last to arrive was Albert Weinshank, whose arrival signaled the armed men to raid. As Weinshank exited his Cadillac sedan on the street, dressed in an overcoat and hat, and made his way into the warehouse, he was accosted by two police officers, who forced him inside. Believing he and his fellow gangsters were being arrested, they lined up against the wall, their backs to the police, all remaining silent so as not to out their boss. Getty ImagesOne of the victims of the massacre. As soon as the men were in line, the police officers signaled to the two plainclothes men waiting outside, armed with the submachine guns. Before the men in line knew what hit them, the armed men opened fire, emptying an entire 20-round box magazine, and a 50-round drum into the men. They continued shooting even after all seven men had hit the floor. The men dressed as officers then escorted the assassins out of the building, under the guise of arresting them. They then fled the scene, remaining unidentified to this day. All seven of Bugs’ men died, six instantly, and Frank Gusenberg later that day. However, the original target Bugs Moran was never injured. In fact, he had never even made it to the warehouse. The assassins had made a mistake, when Albert Weinshank, roughly the same height and build as Moran, arrived dressed in an identical outfit to the man. It wasn’t until after the massacre when Bugs made a public statement condemning Capone, that it was realized that he was still alive. 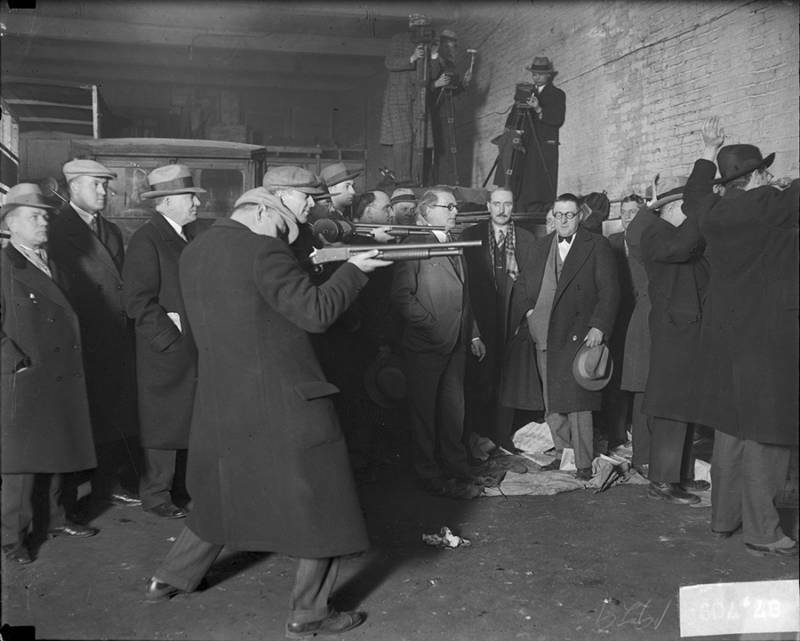 Chicago History Museum/Getty ImagesMen holdings shotguns and other men with hands raised, viewed in profile, during reenactment of St. Valentine’s Day Massacre by investigators. Chicago, Ill. 1929. 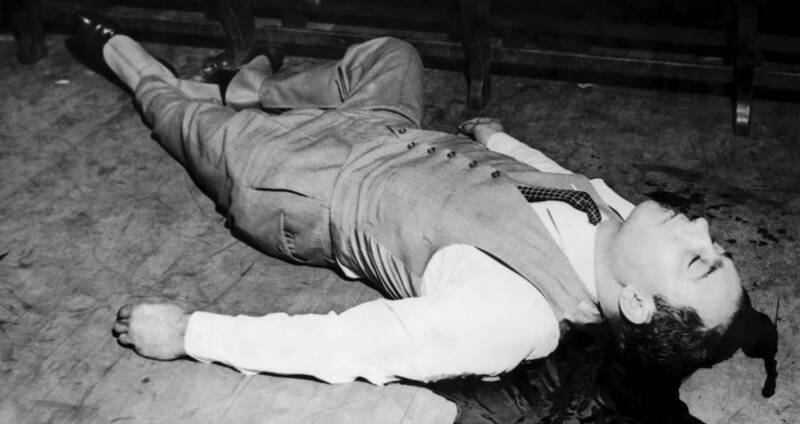 The ensuing investigation focused primarily on Capone, and his affiliate the Purple Gang. Despite two eyewitnesses and several identifications, most of the public believed what the killers wanted them to — that the attack had been carried out by the police, as a scare tactic. One man, Fred Burke, a known associate of Capone’s, was arrested years later for a separate crime and found to be in possession of the guns that were used in the massacre. Burke, of course, denied all involvement with the crime. Capone was later arrested for his many, other crimes, and spent 11 years in prison. Even then, however, he never took credit for the St. Valentine’s Day Massacre, and to this day, the actual perpetrators are still unknown. Enjoy this article on St. Valentine’s Day Massacre? Next, read about the most notorious female gangsters. Then, checkout these infamous gangsters who are still alive today.